I love this skirt. I think I would have loved anything made from this pillowcase. It's about 40 years old it was my mother-in-law's back in the 70's and my husband inherited it when he moved out for college. 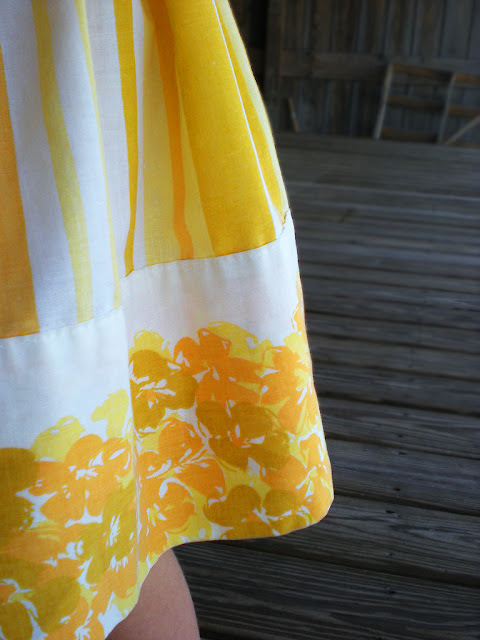 It's soft, it has that old linen closet smell (minus the mothballs), and it looks oh so vintage in it's worn yellowey citrus goodness. So, what to do when you come across such a pillowcase? Pillowcase dress naturally! One rainy Monday, kid #1 went down for morning snooze and I decided to wing it with kid #2 awake. (Of course I didn't take any pictures... not to worry... my artistic genius is below to entertain you) A quick glance at some tutorials and I was off. After all, I only had 2 hours to take out sewing machine, set up, heat up iron, measure kid, etc. Speed sewing... it could be a new sport. She was coloring, I was quickly stitching and ironing away. That pretty much sums it up. It was awful. 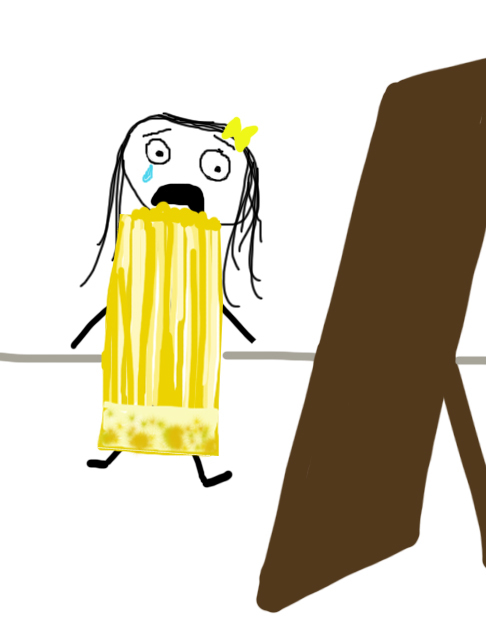 It looked like a giant cube of butter was swallowing her face. She actually cried when she looked in the mirror. I think she was terrified I was actually going to make her wear it. "Take it off, take it off!" I yelled as if the dress were on fire. Maybe I should have read the directions and actually followed them. Determined to save the pillowcase dress disaster, I laid a skirt she already owned on top of the butter-cube-mess of a dress, aligning the bottom hems. I added two inches for the elastic casing at the top, cut, sewed the casing, and put the elastic in. I think it took about 20 minutes total. Hem and side seams done already... thank you pillowcase. Because my kid has an obsession with rocks and mulch, I asked her if she would like me to add rock/mulch pockets. 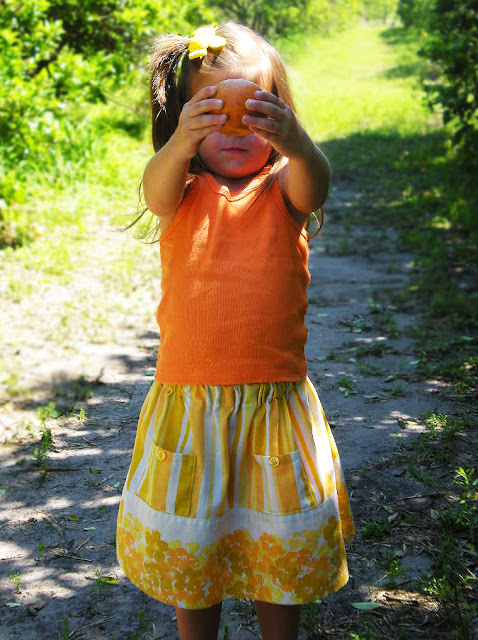 She excitedly agreed.. it needed pockets... for acorns too. I cut two small squares, and folded all of the sides in, and pressed. Then I pinned in place and sewed a big "U" shape around them. She also loves to go through my stash of buttons and asked if we could put a couple on. After convincing her that it didn't need 14 different colored buttons, I sewed the two yellow ones on after she went to bed. Done! 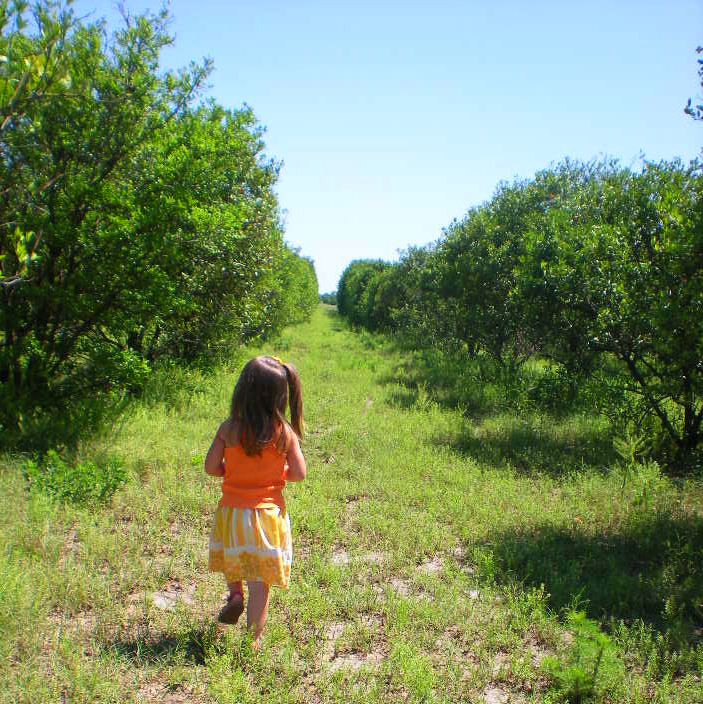 Just perfect for a trip through the orange groves on a warm spring morning (though almost all of the oranges were picked clean). My parents had these pillowcases too! I'm sure they are still around somewhere... Great idea, love the outcome! Thanks for sharing. The skirt turned out so cute. =) What a great idea! 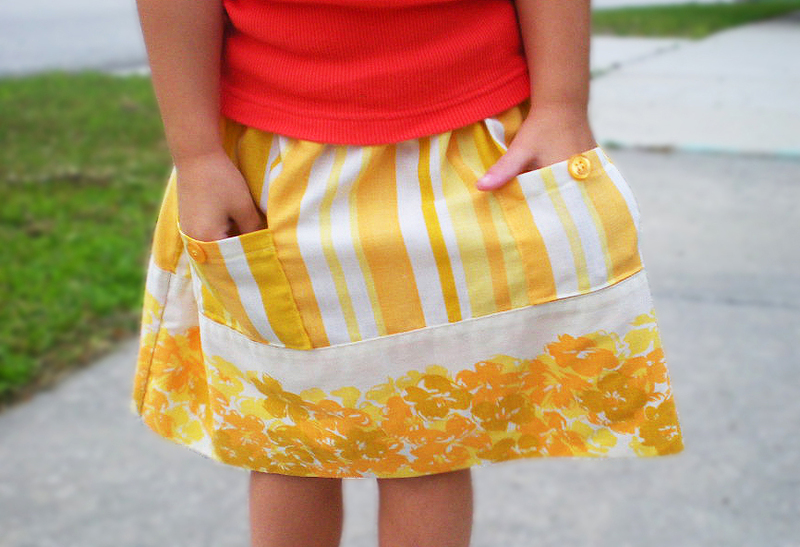 I especially love the pockets and the sweet little buttons. Adorable! You rock Sarah! That skirt looks amazing! Discovered your blog through prudent baby's link love. I laughed so hard at your illustration, you are truly hilarious. I sometimes forget that I even have the option of closing the bathroom door. Always fun to feel like there are people out there who are going through the same things I am. Thanks! Also I love the skirt! I have that pillowcase too LOL! I absolutely love it but I can't bear to cut it! 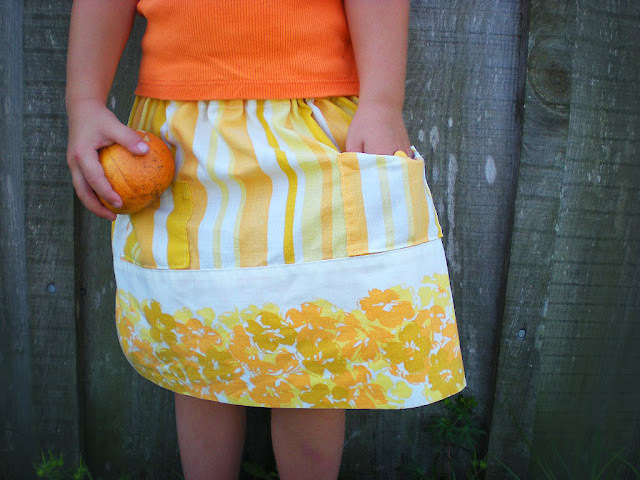 The skirt is lovely. Beautiful as a skirt!! I actually use pillow case dresses as nightgowns for my girls - I don't quite like the look of them as dresses - thanks to you, I now have a better option!! Love it! old pillowcases have such awesome patterns and colors! Hi! Im ur new follower. 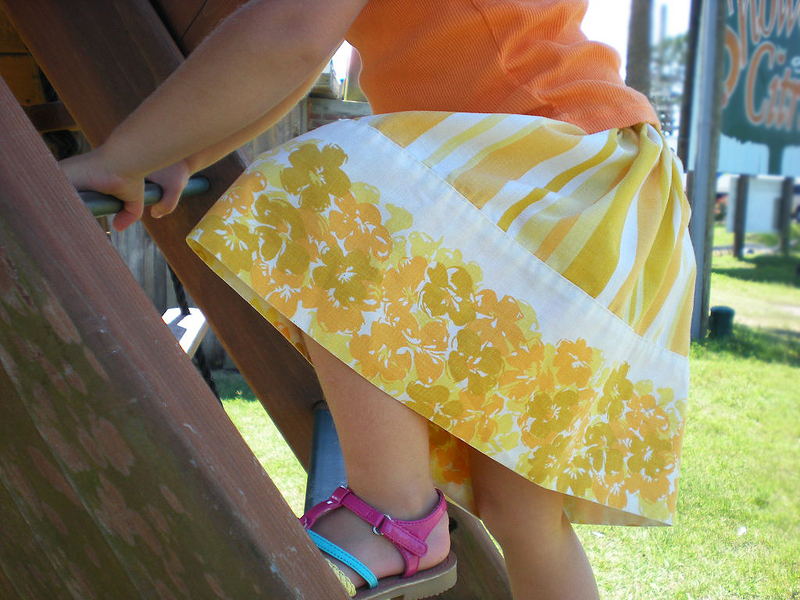 I loved this skirt! Its so cute! clicked in from craft gossip and staying awhile! 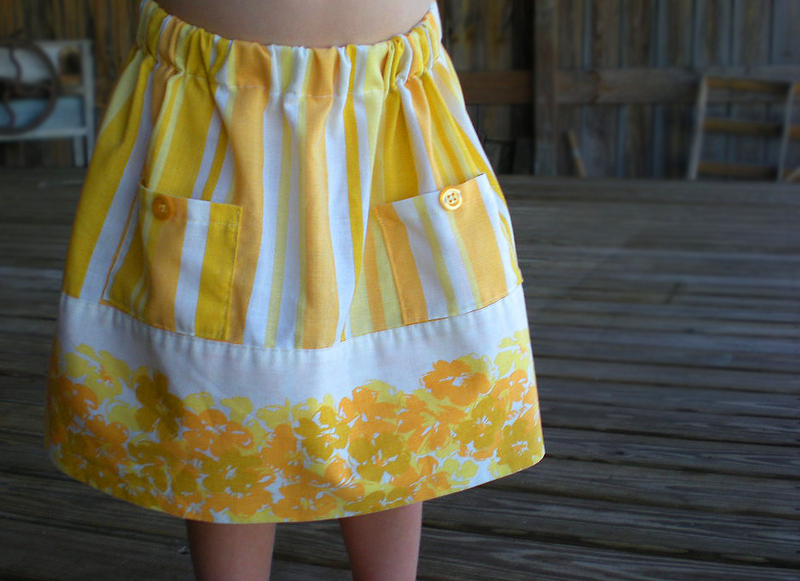 Such a cute little skirt! I would love to feature it on Reduce, Reuse, Upcycle. Feel free to stop by and grab a featured button. Thanks!